Compose Music To A Genius Level? In this article I’m going to go over a few concepts that separate a "genius" musician from the “average” one. ... It sounds pretty amazing that there are ways you can come even closeto genius level, but it’s absolutely true that there are methods you can use to make this a reality. For example, have you ever heard of Socratic Method? The astonishing thing about Socratic Method is that back in late classical Greece and in Renaissance Europe, geniuses in every field surfaced at a rate of 10 million times what emerges from today’s teaching methods. Also, it’s becoming more popular and supported by research studies that there is actually genius potential in everyone… it’s just that most people don’t know how to access these abilities. Now these are probably a little more “advanced concepts”, however they are very usable and effective even to the beginner songwriter. Ok, so the first thing I want to quickly talk about is that every single musical genius that I’ve researched had a mental condition known assynesthesia. To give you a quick example of what synesthesia is… it’s when your brain takes a piece of information and represents it with multiple senses. For example… when someone with synesthesia takes in musical information, they might represent it to themselves as both sounds, and also visual elements… such as abstract images, shapes… or colors. Or they might represent the music as both sounds and also taste. Firstly, having this going on seems to give you a much deeper and richer understanding and experience of music. I can certainly attest to this as after discovering this strange mental condition I formulated some very effective techniques that allowed me to notice the synesthetic relationships happening inside of me. And when this became more obvious my understanding of how music is constructed multiplied 10 fold! The easiest way to explain this without going into too much detail is: Musical geniuses tend to notice a synesthetic crossover of sound and visual information. And when you become aware of these visual elements, it’s like you notice another dimension when you listen to music. Not only are you hearing the music, but you’re also seeing the visual landscape that accompanies it… which is very helpful when you sit down to compose music. This topic warrants more conversation, but for the purposes of keeping this article short enough to digest in one sitting, we’ll move on. If you’d like to get a more detailed look at how you can incorporate this strange phenomenon into your songwriting process though, check out my course The Songwriting Genius Within You. All high level musicians understand how to use their unconscious mind to compose music and write lyrics. And here’s what I mean by this. You’ve probably seen an artist in an interview before, when asked about their songwriting process, talk about how their ideas just “come to them”… sort of out of the blue. Now you might have even seem musicians talk about song ideas coming to them in dreams… and all they do is wake up and write it down..
A really famous instance of this is when Michael Jackson talked about how he had many song ideas in dreams, and because of this he didn’t even feel he could take credit for them. The reason using your unconscious resources is so important in the songwriting process is: the majority of your creative powers exist in these resources. Most musicians compose music from a very consciously controlled, analytical perspective. This is the worst possible way to compose music because your analytical resources have very little creative power, and also using these will make you frustrated and overwhelmed very easily. When you learn to write using your “unconscious” resources, it feels magnificent. It’s extremely freeing, and the quality of song ideas that arrive out of these sessions will be exhilarating to say the least. So how to you write using your unconscious resources? Once you disengage The Squelcher, you will open yourself up to these resources that are normally unconscious, and once you do this you’re in for a fantastic time! To discover how to do this by using simple but extremely effective techniques, check out The Songwriting Genius Within You. Now, there a great book called “This Is Your Brain On Music” that was written by a neuroscientist slash musician named Daniel J Levitin. Mr Levitin conducted and examined the results of experiments to see if he could discover what makes a really great musician. Out of the research he conducted, one of the findings that stood out the most was something he calls the 10 thousand hour theory. The main gist of this is it takes 10 thousand hours of doing a certain task to reach world-class level. It’s the people who do a certain task (such as songwriting) religiously, day after day, hour after hour that end up reaching genius level. And one thing that I would add to this is that with an efficient learning process, this 10,000 hour figure is likely to be much less. I really believe this is true because I’ve shared songwriting techniques with musicians who have written back to me and said that they’ve created more high quality ideas in a few weeks, than the entire year before that. And I’ve also experienced amazing results like this myself. So just quickly… one of the ways to speed up and amplify your ability to compose music is to setup a large feedback loop… such as recording your songwriting sessions where you create in a non-judgmental manner… and then constantly listen back to them. This feedback loop will greatly accelerate your progress. If you want the full instructions to develop in any area outlined in this article, consider purchasing The Songwriting Genius Within You . 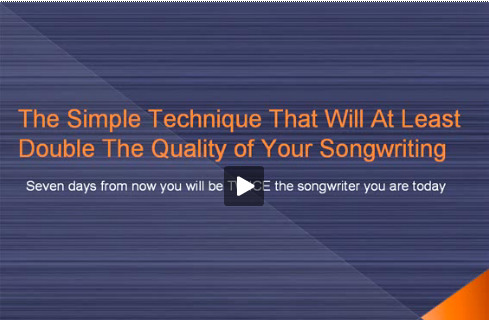 This program can quickly take your songwriting to spectacular new levels.